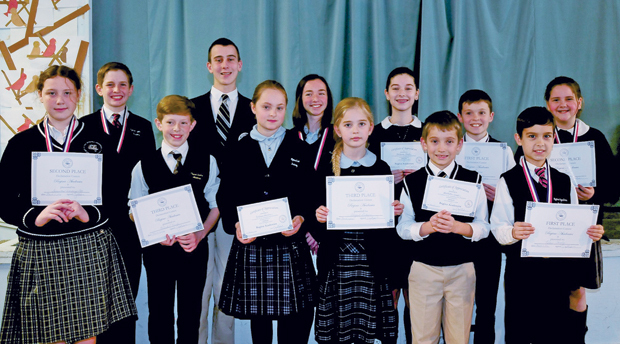 Students of the four Regina Academies int he Philadelphia Archdiocese show the commendations they earned at a public speaking contest this month. 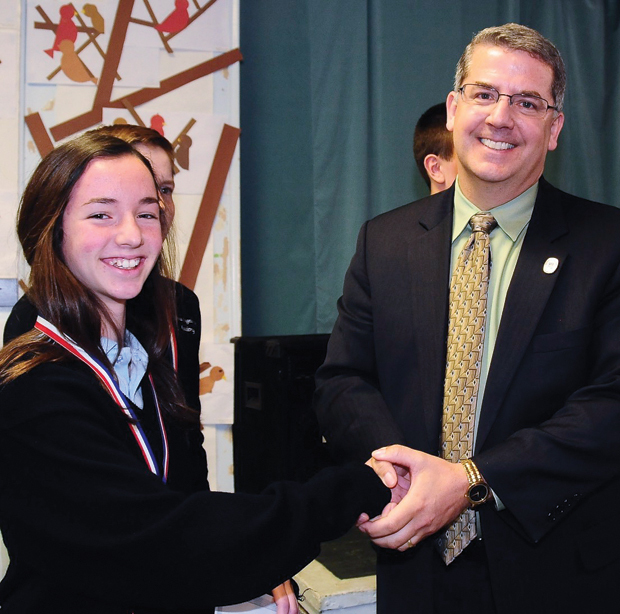 Abigail Dickerson of Regina Coeli Academy won third place in the poetry division of the declamation contest. Have you ever heard of a declamation contest? If not, don’t feel bad. While these competitions date from at least ancient Roman times and were once a common feature in schools across the nation, they have largely disappeared in the last 50 years. Declamation contests feature elementary and middle school students reciting from memory large portions of text — poetry, historic speeches, literature. The student uses feeling, inflection, facial gestures and body movement to impress upon the audience what is being said. And while they’ve largely fallen by the wayside, thanks to the area’s Regina Academies, they’re not a completely dead art form. The system of four independent schools offers a classical education in which the students learn reasoning, logic and critical thinking skills as well a mastery of reading, writing and mathematics. Latin and Greek are also part of the core curriculum. For the sixth year in a row the four schools making up Regina Academies — Regina Angelorum in Ardmore; Regina Coeli in Abington; Regina Luminis in Downingtown and Regina Academy at St. John the Baptist in Ottsville — gathered for the contest this March in the basement of St. Colman Church in Ardmore, which was filled to capacity. Regina board member Tim Murname believes the reason for the contest is simple. “We understand that having the confidence to present and defend your ideas in public creates leaders who will someday improve both our church and our society,” he said. The competition saw one student from each school compete in three brackets: Poetry, grades 3 and 4; Prose, grades 5 and 6; and Orations, grades 7 and 8. Anna Castagno is presented with a $5,000 scholarship award to attend Cardinal O’Hara High School by school President Tom Fertal. Finally Anne Castagno of Regina Coeli took first in the oration segment by reciting Jean Valjean’s soliloquy from the play “Les Miserables.” She also received a $5,000 scholarship from Tom Fertal, president of Cardinal O’Hara High School. Local author and competition judge Brian Gail agreed.